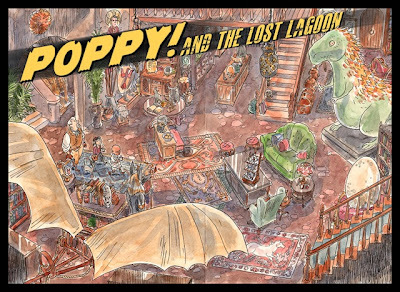 Matt Kindt, the award-winning, New York Times best-selling author of MIND MGMT and Red Handed, and Brian Hurtt, the award-winning, New York Times best-selling artist of The Sixth Gun and The Damned, are soon to publish Poppy! and the Lost Lagoon, the first in a new graphic novel series for children. The book follows the story of Poppy Pepperton, a ten-year-old girl with a typographic memory who goes on globe-spanning adventures with her sidekick Colt Winchester (who thinks he’s her legal guardian). Publishers Weeklyannounced last week that Poppy! and the Lost Lagoon will be published in 2015 by Dark Horse Comics.